To ensure there is no water buildup behind your retaining wall, drain pipes must be vented properly. 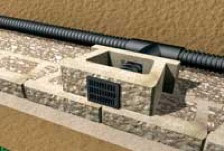 Drain pipes must exit to daylight or be connected to an underground drainage system. We recommend 4 in (10 cm) perforated flexible drain pipe or rigid perforated pipes. When a rigid perforated pipe is used, it should be placed with holes down. It is recommended that a minimum 1% gradient be maintained on the placement of the pipe with outlets on 50 ft (15 m) centers, or 100 ft (30 m) centers if the pipe is crowned between the outlets. Also be sure that all pipe outlets be configured to be protected from crushing or plugging from other means. Rodent screens are helpful to prevent nesting within the pipe. Cut adjoining block to allow for installation of a manufactured drain cover. Alternatively, Wall Drain Pro could be used without the requirement of cutting block. See more information here on Wall Drain Pro.